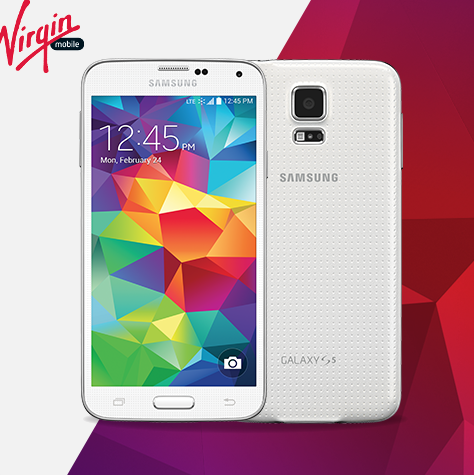 The Samsung Galaxy S5 for Virgin Mobile is on sale today for $499.99 at virginmobileusa.com. That's $100 off the regular $599.99 price. The sale ends at 7:00 AM EST tomorrow 8/20 so don't procrastinate if you want this deal. In addition, there's a $100 account credit for customers who purchase an S5 during the sale and activate it on a new account and pay for the first month of service by 11:59 PM EST 8/30/14. With the credit, the S5's effective price is $399.99. The Galaxy S5 can be used on any Virgin Mobile Beyond Talk plan. Plan prices start at $35/month for unlimited messaging, unlimited data (throttled after 2.5GB) and 300 voice minutes. If you need more minutes, Virgin's $45 and $55 plans include 1200 and unlimited minutes respectively, with the same unlimited messaging and unlimited but throttled after 2.5GB data. The S5, Samsung's latest flagship, runs Android 4.4 KitKat and features a 5.1 inch 1920 x 1080px Super AMOLED screen, 16 MP main and 2.1 MP front facing cameras, 2.5Ghz quad-core CPU, 2 GB of RAM and 16GB of internal memory. Available from 8 a.m. EST 8/19/14, through 7 a.m. EST 8/20/14, or while supplies last. Account credit valid for new customers only. Account credit offer valid only on any new Samsung Galaxy S® 5 4G LTE purchased and activated on a current Beyond Talk plan on virginmobileusa.com during the promotional period. Excludes taxes and overnight shipping fees. Account credit equal to $100. Customers must activate a new account and Top-up for at least one month of service on the $35 unlimited plan by 11:59 p.m. EST 8/30/14, to be eligible for the account credit. The account credit will be applied toward account within 30 days of the end of the promotional period. Credit may not be exchanged/redeemed for cash or merchandise. Limit of one account credit redemption per new account. Virgin Mobile USA reserves the right to modify, extend or cancel this offer at any time. Not available in all markets. Services subject to additional terms, restrictions and other conditions. Update 8/20, the sale has been extended with the Galaxy S5's price cut another $20 to $479.99. However, the account $100 credit offer has ended. I would Never buy Virgin Mobile Phone again. I brought Mine from Virgin Mobile website. When I try To activate my phone. I was told it lost or stolen. I call up ask for manager and refused to help. I Went on Vacation when I came back and try again pass the 30 days return policy. So I wrote a letter sent to my state Attorney General within 48 Hours after my case was activated with the fraud Department it was activated buyer BEWARE. As a follow up to my recent voicemail regarding your AGO complaint with Virgin Mobile USA, I look forward to assisting with bringing your concerns to a resolution. My direct contact phone number is 877-291-5717 please reference your case number 208XXX at the time of your call. I am available Monday through Friday from 9:30 a.m. to 5:00 p.m. (cst). You only get 14 days to return, I think you are making up your own story. I've had a little better luck reaching help in Virgin than I have with Verizon. I have no experience with AT&T or the uncoverage company, though. Anyway, how did you have a 30 day return policy? Now it is 14 dayts. They must have change it. When I brought it was 30 days . I brought by phone last year. I have nothing to gain by make it up. I'm just trying to help. It's a free country you do as you wish. When you walk in my shoe you'll understand. If I help one person great, If, not at least I try. Maybe I'm the only one that had that problem. I know. It was ridiculous to claim that you made it up. All I did was relay my personal experience, and that the return window is now 14 days. Someone else got over suspicious! The HTC Desire 816 for $200 from QVC seems like a better deal. I had a great experience with Virgin Mobile cs when activating my new HTC desire 816. And also when I went to one of their stores. So far so good. Excellent price for a top of the line phone. Does anyone know whether this phone could work on Verizon, Page Plus Cellular, or other US Carriers? I got one of these to replace my Galaxy S3, from pretty much this exact deal, after I read about it here in Dennis' House of PhonePhats. The battery life of the S5 did not impress me at all. In the rest of the specs, it was incrementally better... with a much sharper screen that was noticably larger. The fingerprint reader, as all the reviews say, was dodgy, and I figured I'd never use it. However, even the difference between the S3 and S5 (leapfrogging the S4!) wasn't enough to justify the cost. I sent it back, and Virgin credited my account quickly. CDMA phones need to be flashed to work on other CDMA operators. I don't know if S5 has been flashed successfully or not. been wanting a nice galaxy phone. and so the anon above who says the difference between S3 and S5 doesn't justify the cost, my thinking then is it may be best to get a S3 instead if you can find a good price? will start looking for a nice cheap S3 instead. thanks. I am that anon (the one who bought this Virgin S5 deal and returned it) and am answering the person who is "wanting a nice galaxy phone". The differences between the S3 and the S5 were too minor for me. But you might disagree. There are many direct comparisons between the two online, so make sure to research. Also consider that you might want to look at the S4, which is in between the two, in features and price. You might be able to find a nice S4, better than the S3 perhaps in ways that are important to you, while still saving a LOT compared to the S5. Be careful, though, if you consider the S4 "Active". It is not well publicized, but the technical specs are not the same as the regular S4, and are worse. The non-active S4 has a better screen, much better camera, more memory capacity, etc. The Verizon S4 refurbished is only $200. It works on Verizon, AT&T and T-Mobile it's also very similar to the S5. VM Samsung Galaxy S5 STILL on sale $479.99 free shipping @ 07:13AM Wednesday !! Suggestion for Dennis: Last time I checked, there were carriers in "News by Carrier" sidebar that are dead. Zact and Radio Shack are among the most recent, but I thought there were ones that had been mouldering in the phone-grave for much longer. I would suggest not removing them, but indicating them somehow .... listing them after, putting an asterisk, or making the dead ones red. Besides, when you click on the news for any of the defunct carriers, the first story you see is about the operator shutting down. A better idea would be to indicate which network each carrier uses. Maybe by adding a code to the name like this (V) = Verizon, (A) = AT&T, (T) = T-Mobile and (S) = Sprint. I'm thinking of combining both suggestions by adding letters (a, t, s, v) to indicate which network(s) each operator uses with an empty parentheses () or (dead)for defunct carriers. Dennis I was just wondering why use lowercase letters for the network codes? I think they look nicer. Why is the code (u) for U prepaid? I think Upp wireless has the wrong network code. You're right, it should be t for T-Mobile. I'll fix it. I'm not adding any more codes until I can add a key section indicating what all the codes mean. Without that it's just gobbledygook to most people. Adding the key section will require some custom coding as the sidebar is autogenerated by a widget. I prefer spending my limited time covering the latest prepaid news. Also I'm not convinced the codes add much value. If you want to find out which network an operator uses and whether it's all IP or anything else, just click the link and read the posts about the operator, there's way more information in them than can ever be conveyed with codes. The (IP) code isn't very important however the network codes have great value if some one is looking for a new MVNO on a specific network they need either for the coverage in their area or because of the phone they want to use. With the codes anyone can easily find the MVNO that works for them without the need to click on every operator. Noting which operators are out of business also saves time. The (IP) code would tell someone to avoid an operator if they don't want that type of service. To save time you could just add a link at the bottom of the list that links to a page with the keys. Just an idea. The News by Carrier sidebar is for people who have heard about a carrier and want to know more about it. My expectation is that they will click the link and read the posts about that operator. I added the letter codes to see how they would look and what the reaction from readers was. Result: I think they look a little messy and as far as I can tell only one anonymous reader as commented on them. I count two or more readers who have left a comment. I'm the anonymous who had the idea for the network codes, the (IP) code and adding a link to a footnote page but someone else left the first comment about indicating which operators have gone out of business and there are other comments here as well. The network code idea was modified to also indicate which operators are out of business with () and I think it works. It wasn't my idea to indicate which operators are out of business but it's a good idea it's confusing to have operators that are out of business on the same list as operator that are still in business with no way to tell them apart. I am very sorry if I have offended you with my suggestions. If you post as Anonymous there's no way for me to distinguish you from other Anonymous commenters. If you want your voice to be counted take the 5 seconds extra it takes to post using a name. It doesn't even need to be your real name, although that would be nice. I'm not offended, in fact I encourage your continued participation in this discussion, preferably using a different handle than "Anonymous". You're right about posting as anonymous but why would it be nice to use my real name? Handles are fine as long as you pick one and use it consistently rather than trying to pretend you are more than one person. But I think using your real name shows honesty, openness and a willingness to stand up for what you say. I understand what you are saying but I never pretended to be more than one person. Not better. I quite like your idea. Have it along side mine, if Dennis likes either! I'd love to be able to see the (T) stories and automatically ignore them . You're right I didn't mean anything by it. Maybe Dennis could indicate which carriers have gone out of business by adding another code. The Nexus 6 does indeed look to be great. The problem is that the page I checked is kind of a rumor page, and I can't find one better and more authoritative.